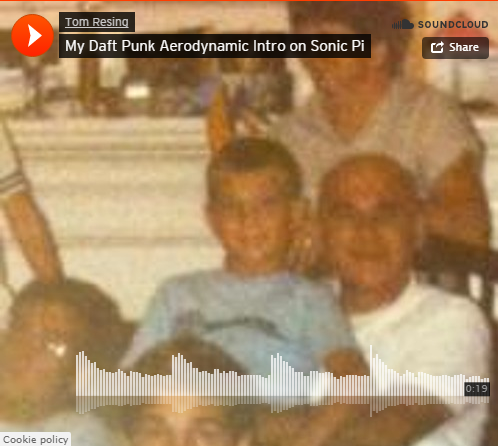 Aerodynamic in Sonic Pi sounds great. There’s just one thing that bugged me. The bells. The walk-through, featured on Hacker News, Techcrunch, Twitter and more, explains the code for the song in detail. And, the author writes that the sound, or timbre, of the bells in the intro isn’t quite right. Working on this project takes me back to my college days. Back when I was a Music Performance and Computer Science double major at Northwestern, I would get questions. “Do you want to write music with computers? ” No. I didn’t. I wanted to play bassoon and learn programming. But, in this one case, I’ll make an exception. Like I said, the Daft Punk song in Sonic Pi sounds great, for the most part. Sébastien Rannou, the author, explains in great detail how the pitch and timbre for the bells in the intro is determined. And, he explains some techniques for improving the synth bell included in Sonic Pi’s library. In the end, the sound just doesn’t come close enough to my ear, compared with the rest of the song. I posted the 15 second intro from the original to soundcloud so you can listen to compare it to the sonic pi version. You can hear the difference in the first 15 seconds of the Sonic Pi version by Sebastien above. Download the chimes samples from newman.ch and change the directory in the sample line above to the directoty you exapand the zip to.